The following is a guest post by Greg Hickman. Greg is a blogger and podcaster that teaches people how to build a plan to leave their corporate jobs and work on their own terms. He shares his journey by leveraging his mobile marketing experience through a successful blog and podcast in his area of expertise, and now teaches others how to do the same at GregHickman.me. He is also the host of the Leaving Corporate podcast. 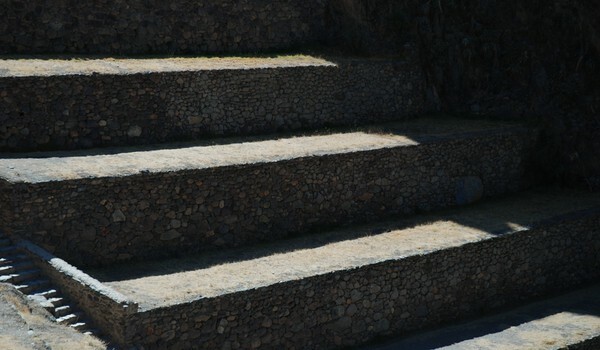 Greg believes success comes from consistent action and the habits that create that action. If you want to steal his workflow, he has a free video for you here. Just take it! One of the biggest obstacles for me feeling and being productive is knowing what to actually work on each and every day. I can’t tell you how many times I’ve looked at the clock and it was already 5pm and I had no idea if actually got anything done. That feeling stresses me out which leads to me working into the evening hours, not being present during dinner with my fiancée and, ultimately making her mad at me—all while feeling like I am falling behind. If you’ve felt like one little unplanned call or email in your morning has derailed your entire day leaving you with nothing to show for it by 5 p.m., I know how you feel. I needed a way to know exactly what I should be working on each and every day. Managing two blogs and two podcasts is a lot of work so I needed a system that works. I needed it to be so easy that it could become a daily routine. I’m going to share my daily journaling routine that has single handedly made me more productive by not only identifying what I should be working on each day but, identify the ONE thing I need to be working. Just because I have two blogs and two podcasts doesn’t mean I need to be working on both at all times. Each day starts with a specific set of questions. I know even the littlest things can side track me…like the thought of having to type out those questions each and every day. TextExpander lets me setup a “snippet” such as “;stuck” that then auto-populates pre-determined text, such as my daily journaling questions. As you can see in the image above I break up my questions into two parts; yesterday (1) and now (2). 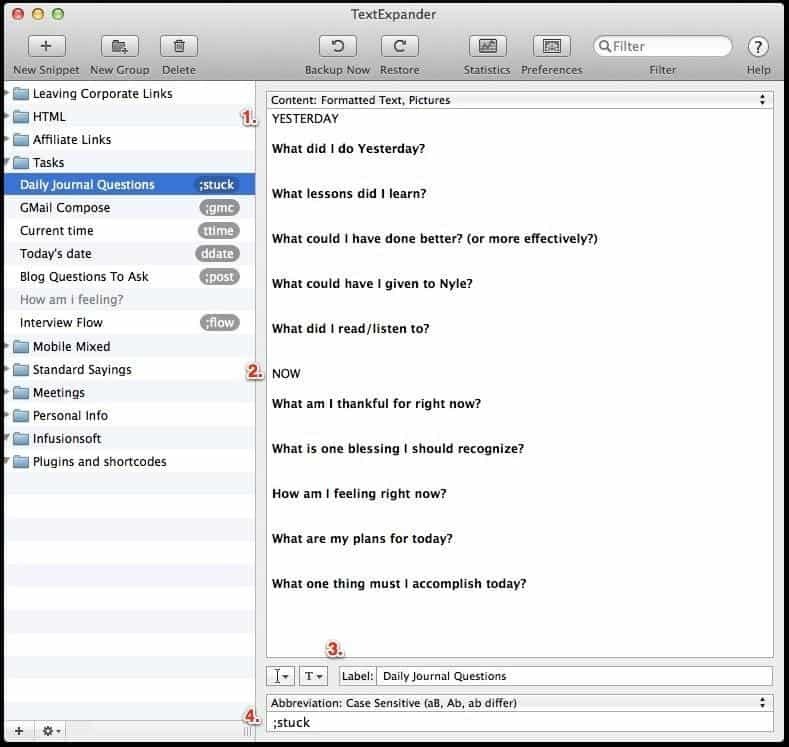 In TextExpander I labeled this “Daily Journaling Questions” (3) and every time I type the abbreviation “;stuck” (4) my daily questions are magically on the screen ready for me to answer. Now, all I have to do is click into each question and start answering. These are all organized by month and year as well. Keeping all of my writing in one place makes staying organized way easier. I used to do some writing in Google Docs, some in Evernote, some in Byword and some in Scrivener. I realized that, over time, it was a real pain to keep in order. Once I finally adopted this simplified system, I only have to open the one doc every day. This question is meant to recognize ways you can improve and be more efficient. By taking a minute to reflect on the previous day you’ll uncover ways you could have been more effective. This moment of reflection is one of the three things you can do to consistently deliver great work. For example, I’ve noticed that when I have a 30 minute call scheduled, I often let it go 45 minutes to an hour. That typically leads to me going into the next task/block already behind. A.K.A. the overwhelm sets in. Trust me, you’ll realize you’re writing the same things over and over and that’s when you’ll realize it’s something that needs to be changed and improved. 2. What could have I given to my assistant? This question is aimed at identifying things I can offload to my executive assistant, Nyle. By reflecting on my previous day, I uncover things that I could have, and usually should have given to my assistant. I’ll realize that an email I wrote was something I can turn into a template and have her respond to, or creating graphics for my blog posts like this one. Let’s face it. We shouldn’t be doing everything in our businesses. Until I asked myself “what could I have given to Nyle?” every single day, I was actually doing too much. Note: I continue to learn and grow with my assistant and the systems definitely take time to create and work out so they are your own. None of this happened overnight for me but if you follow these instructions they could literally save you a years worth of time. 3. What are my plans for today? 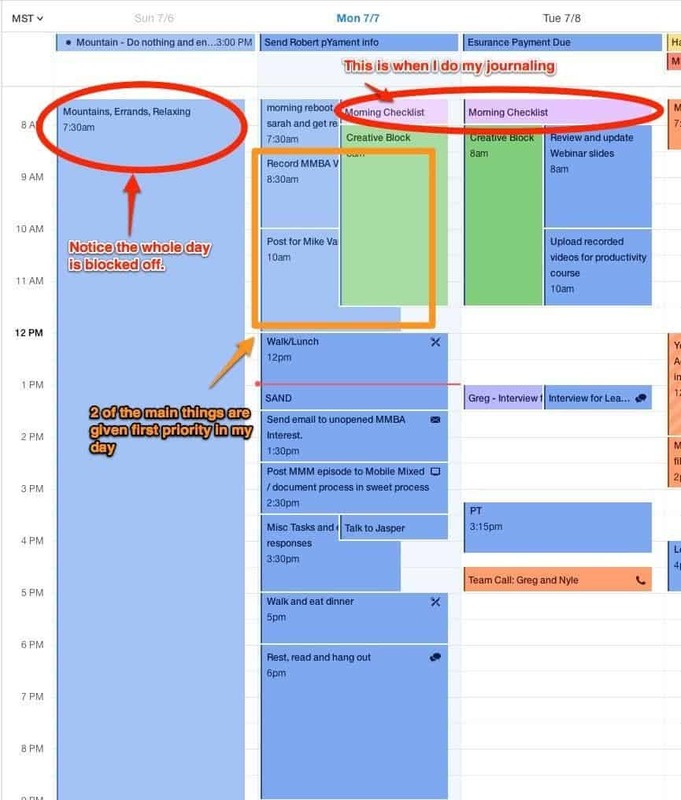 The goal here is to focus on what you really need to get done that day, but this exercise makes me realize that sometimes I prioritize things that don’t necessarily need to be done that day. From there I move them around if it’s not critical for that day. 4. What one thing must I accomplish today? There it is! The most important question you should ask yourself each day. What is the ONE thing you must get done? For me (on the day of writing this), it was recording some videos for my training product, The Mobile Marketing Business Academy. When it comes down to it, we should really only be focusing our efforts on a few key things each day. The rest is just sand, which I’ll talk about shortly. After interviewing tons of successful entrepreneurs on Leaving Corporate such as John Lee Dumas, Amy Porterfield, Jeff Goins, and Michael Hyatt, I’ve found that they always focus on no more than 3 main goals for each day. Many of us (myself included) take on too much in each day which leads to overwhelm and sets us up for failure and disappointment, killing momentum the next day. You can actually give attention to two things, but that is what’s called “divided attention”. And don’t get fooled. Take on two things and your attention gets divided. Take on a third and something gets dropped. Ok, so you’ve done your daily journaling exercise, outlined what needs to get done and picked out the most important thing for the day. Write out the questions you’d like to ask yourself starting tomorrow morning. Make sure to include the 4 key questions above. 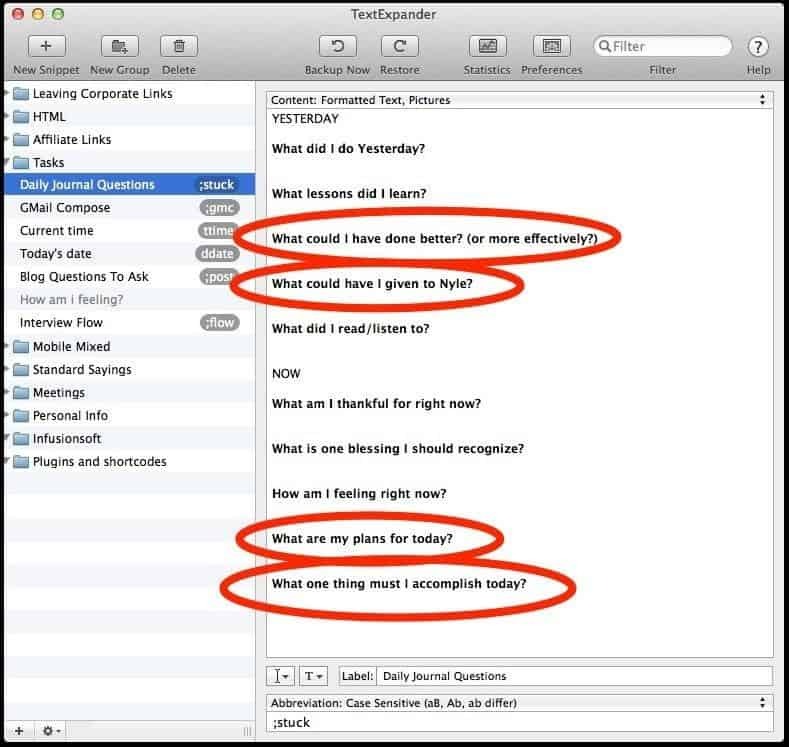 Set up TextExpander with your key questions to eliminate any additional obstacles. Steal my snippet of ‘;stuck’. Block off 30 minutes each morning to answer these questions. It may take less, but it shouldn’t take more than 30 minutes. “Don’t focus on being busy; focus on being productive. Allow what matters most to drive your day” – Gary Keller. Since we’ve identified what matters most we need to make time for it. In The One Thing, Gary Keller introduces the strategy of time blocking. Time blocking is a very results-oriented way of viewing and using time. It’s a way of making sure that what has to be done gets done. I like to leverage time-blocking on steroids. Or as my friend Bryan Harris calls it, Zero-Based Calendar, which I’ve talked about here. The goal of the Zero-Based Calendar is to have every hour accounted for. I don’t know about you but the worst feeling is looking back on yesterday and feeling like I could have been doing something during an open block of time. Now that I’ve implemented this strategy, I’ll know what I was doing and will have even capitalized on that time. Even if that time was working out, walking, resting, or reading, something happened during it that I controlled. You’ll notice every hour is blocked for something. Even personal things like eating dinner and relaxing for the night are accounted for. Now, the reason Tuesday still has openings is because I really don’t assign my time blocks until the morning of, and at the earliest, the night before. When creating time blocks the night before I’m really just looking for the key things that need to be accomplished that day making sure they are captured in that “creative block” of time. I’ve found the mornings to be the best time for me to get things done so I do all of my important tasks as early as possible. That’s why I have a recurring time block called, “creative block” from 8 a.m. to noon, Monday through Friday. This block is meant to prevent me from scheduling calls or accepting meetings in the morning hours unless I choose to do so (which happens sometimes). Once you’ve blocked off your key projects for the day you’ll find that you have small chunks of time unassigned. Don’t panic. If you have little tasks to fill those gaps by all means fill them in, but, if you aren’t sure what should get that time, name it “Sand.” Sand tasks are little things you need to get done that don’t really deserve their own block of time. For example, in my list of tasks above, “sending Robert payment info” is one of my “sand” tasks because it will take me only a few minutes to complete. Another example would be calling to schedule a massage or making a car payment. As you create your list of “to dos,” figure out which ones are really sand. When time strikes and it’s your sand block, look down at your sand list and start knocking as many of those off your list as possible. Finish whatever is left during another sand block. For me, if it’s not on the calendar it doesn’t exist. Take your most important task for the day and block off 90 minutes to 3 hours to work on it tomorrow. Take the remaining tasks and block time for those the rest of the day. Make sure to block off time for personal tasks such as eating, picking the kids up, working out, etc. Make sure your calendar is full from when you wake up till you go to bed. We all know the deal. We’re in the zone, working away and then we check our email. The next thing we know, we’re dissecting an email that made us buy and it’s 30 minutes later. Or, we check Twitter only to see a really interesting article that we have to read. One turns into two, two to three, and so on. Next thing we know we’ve lost over an hour. Yes, I know you want to read that article because you think it will add value now, but you most likely don’t need it right now. That doesn’t mean you shouldn’t save it for when it’s appropriate. Appropriate means either you have set aside time to consume content or you need to learn what the content is teaching. I recommend using one tool and one tool only for keeping track of ideas, inspiration and things you want to implement that you’ve read online. 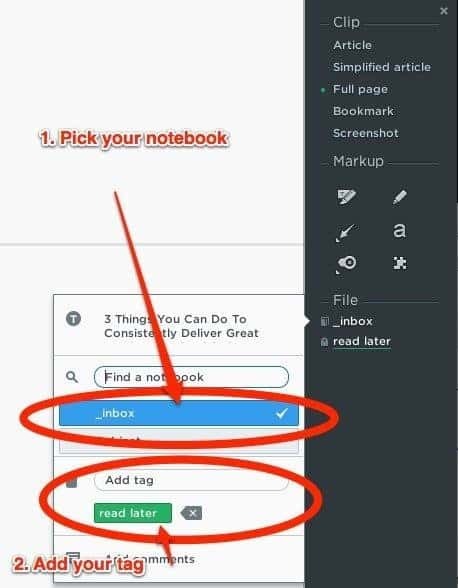 I know you’re familiar with Evernote, but are you using it correctly? I recently adopted Michael Hyatt’s new Evernote setup and it’s done wonders for my productivity. The key behind this system is using only two notebooks: Inbox and Cabinet. Inbox: New things that you’ll have to filter and tag appropriately. This is to reduce the amount of distraction that content can be that somehow finds its way in front of you without you knowing it. Cabinet: Content you want to keep and reference later but in a way that is efficient based on your needs. From there every note gets a tag. Here are my tags and “tag categories”. 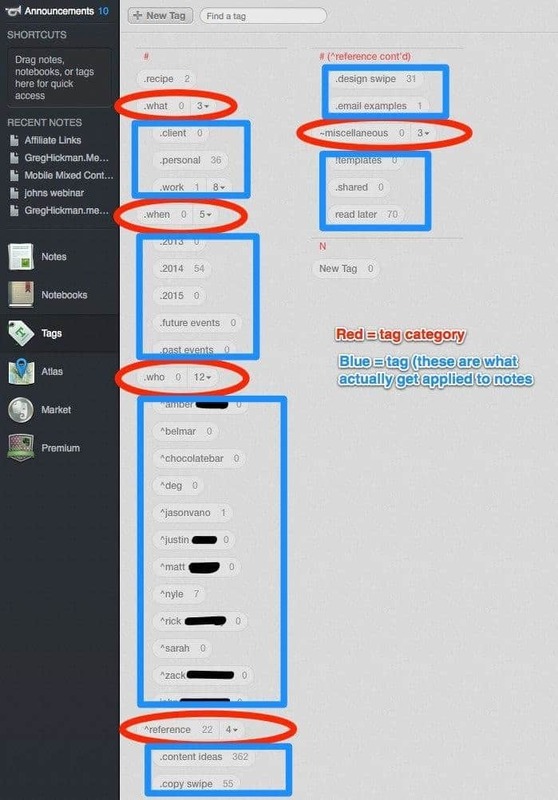 Using these tags makes searching within Evernote a breeze. If you keep a simple structure you can quickly find what you’re looking for. The tags I use the most are what keep me productive because I’m able to quickly save content for later consumption. Now, when I’m looking for ideas for content, I open Evernote and do a search for “.content ideas” and – voila! 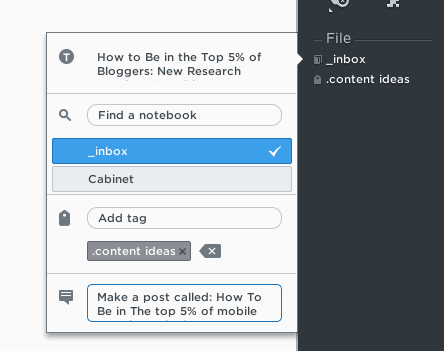 Make Evernote the one app where you keep everything from content ideas to recipes to read it later articles. Adopt the tagging system from Michael Hyatt’s post or this one. 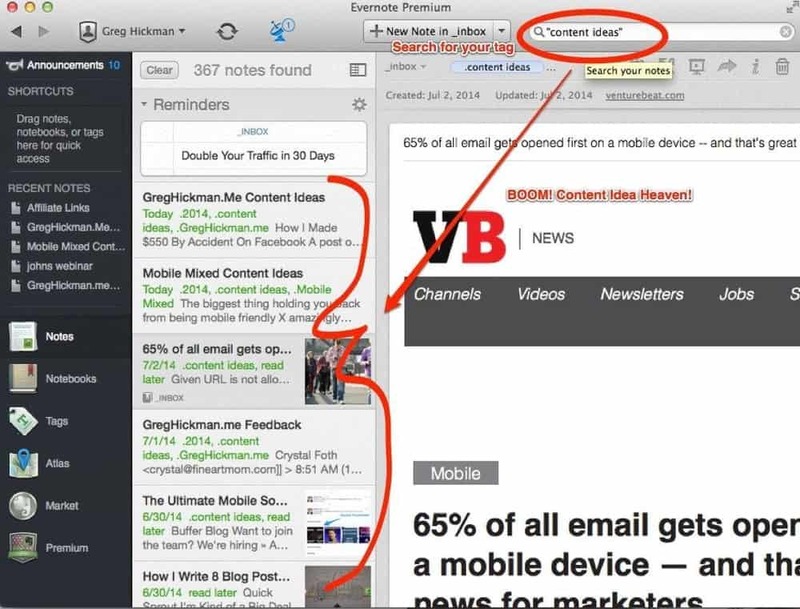 Install the Evernote web clipper and begin tagging articles for later use. Pro Tip: Block off time each day or week to consume content. There is no secret sauce to this system. Simply, it’s adopting certain tools and habits and sticking to them—each and every single day. There are so many tools out there that you can use to implement what you’ve learned today and it’s up to you to decide, but, if you’ve been lost and just buying tool after tool hoping it would help, why not give this system a try. When you block time on your calendar for important tasks you’ll get calendar reminders for when you’re supposed to move onto the next project or break. I hate skipping breaks. If you’re like me, you need a system to move forward. Take action now. Make it a habit. Continue until you reach success. Repeat. If you’ve liked this post, download a free video where I share this system in more detail.